The beginning of this book had me hooked. I mean, Dru’s dad was loading a gun on the freaking kitchen table. And he’s all just like “How’s life, sweetheart?” What the heck? And Dru is talking about being able to see ghosties and other creepy night crawlers. Total insanity. But that’s exactly why I kept reading it, because the entire book was like this. This book had more action than one of those Bruce Willis movies where he lives free or dies hard. Or both. Dru as a character was great, strong and independent, although there were some parts where I wanted to smack her in the face. Example: She follows this goth kid that she JUST MET to a secluded place behind a mall that offers virtually no escape, after having taken down a zombie who, oh look, just so happens to have been her dad. (By the way, that’s not a spoiler, seeing as sit says her dad is a zombie on the back cover.) Hasn’t she ever heard of stranger danger? I guess when one hunts the creatures that go bump in the night for a living, one doesn’t worry for these things. Graves was also very well fleshed out. One of the things I loved about his and Dru’s relationship is that, you just know that they are eventually going to fall in love- - the potential romance is there, staring you in the face from the very first chapter- - but it’s so casually avoided that, as a reader, you don’t feel rushed into it or pressured. There just comes a point where you say, “Yep, they’re going to be an item” and you’re totally cool with it. Okay, time for the LOVE factor (“love” on my part): Christophe. I drooled over him. I really think that the book would have been a bagillion times better if he had been introduced about 100 pages earlier. There was just something about him that made me instantly take to him, and I was severely disappointed to find he wasn’t as involved as I think he should have been. Oh well, here’s hoping that the next books will include him heavily. 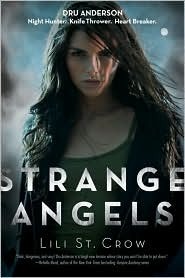 The cover for Strange Angels is really intriguing. There’s so much tension, and I love the look in the model’s eyes. It says, “Do you really want to screw around with me? No, I didn’t think so.” The back cover is also interesting. Zombies? More specifically, dad zombies? This book is a solid five star. The pros so heavily outweigh the cons that I can’t justify rating it anything below five. This is a DEFINITE must read. I just finished this book tonight, and did my review too. I whole heartdly agree with the things you said in the review. I was thinking to myself what is up with christohpe, and I got my answer. I have the second one ready to read. Here's to seeing more of Christophe in the next book.